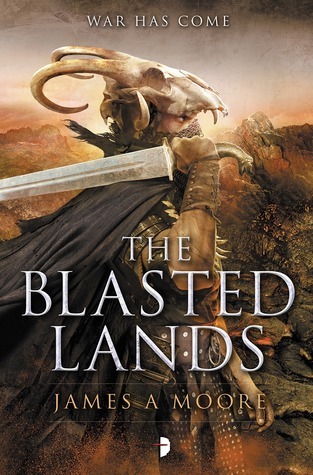 The Blasted Lands is the second book in the Seven Forges series written by James a Moore. My review of The Seven Forges is here. Now, if you haven’t read No.1 in the series you should be warned that this review will undoubtedly contain spoilers for that book! Be warned. The first book in the series got off to a really good start. I had a few niggles and I can’t say I was in love with the cliffhanger ending – given the waiting time to find out what was going to happen next – but, the wait was worth it. This book builds very effectively on the first in the series and does not suffer at all from ‘second book’ syndrome. On the contrary, the world building was much improved. The characters more developed. And, some of the intrigue given explanation. In the last book we were made familiar with the Empire of Fellein and it’s people and Emperor. At the same time a band of characters travelled the Blasted Lands in pursuit of knowledge of the Seven Forges where they met a race of previously unknown people – the Sa’ba Taalor. I’m not going to recap all of the previous story – just suffice to say it ended with the Empire and the people of the Seven Forges looking set to go to war. A quick recap of characters – Desh (The Magician), Merros (a soldier – now made General), the sisters (magical assistants to Desh), Tega (magical apprentice to Desh), Andover, (from the Fellein empire – lost both of his hands in an attack and received a strange gift from one of the Gods of the Seven Forges), Tusk – a king of the Sa’ba Taalor. The Blasted Lands continues with Andover’s journey, as an ambassador of Fellein to the Seven Forges where he will meet not only the people but the Gods they worship. He’s going to face trials and hardship along the way and in doing so will introduce us to this strange race of people who are so devoted to the serving of their Gods that they literally have no fear of death itself. This is a really interesting race of people. Their way of life is simple. They live by fairly strict codes. They answer to their Gods implicitly, some serving only one whilst others serve a number. I’m still not quite sure what to make of Andover. In one respect I’m hoping that he will be an intermediary between the two races but on the other he seems so overwhelmed by the way in which the Sa’ba Taalor have accepted him amongst their people that it seems quite possible that he could be used by them in some way and simply go along with things in order to feel part of something. I confess even after finishing the book I’m still unsure as to what his eventual purpose will be but the journey he has made so far has certainly been fascinating and held a number of revelations – not least of which uncovering the reason why the Sa’ba Taalor hide their faces behind a veil. I won’t say more! Back in Fellein Merros, Desh and the new Empress (Nachia, cousin to the murdered Emperor) are making preparations for war – not easy with a nation that has gone soft of course and impeded by rumours of black ships attacking other parts of the empire and strange foretellings of doom by the ‘sooths’. Not to mention attacks by strange monsters that seem to be the result of necromancy. The Sa’ba Taalor are not of course standing idle. They are making their own plans and what is intriguing is that they all go about separate missions, directed by whichever God or Gods they serve and yet their ultimate purpose seems to serve the same goal. This is a ruthless set of people, cold blooded, unafraid, frankly quite scary and tough as old boots – not to mention they’ve got a few tricks up their sleeves when it comes to tackling any wounds they receive during the course of any skirmishes they encounter and a few ways of blending into a group or crowd of people unnoticed. There is also a bigger picture here that is revealed at the end of the book and uncovers a little bit more background – only a little, almost a teaser, but still quite a light bulb moment. I enjoyed the first book in the series but without doubt thought this was better. In fact I really had no quibbles at all. I suppose you could argue there maybe isn’t as much action in this instalment but in spite of that it’s still a fast paced novel and the world building and time spent with each character definitely adds extra value. I received a copy of this from the publisher through Net Galley. The above is my own opinion. I’m submitting this for my Once Upon a Time event under the heading of ‘fantasy’. Stop over to Stainless Steel Droppings to check out this event. I suppose I should start with the first one, but it is always nice to know that a series improves! I enjoyed the first – it was a little slow but then it eventually caught me! This one I felt had good world building and quite a few reveals. Glad to hear this was better than the first. I liked Seven Forges, though I have to admit I didn’t really get into it until the very end – those last few chapters were amazing! I think it changed my opinion on the whole book. But of course, that pesky cliffhanger. I will definitely be picking up this book, but maybe I might even wait until the whole series is done to do so. Sounds like it ends on another teaser! Yeah, I liked Seven Forges but this was definitely better. The world building and character development was just much improved. It is a bit of a teaser – although not quite as big as the first book! I’m beginning to think that waiting for all the books to be out is a damned fine idea! I wrote a fairly complementary review of Seven Forges, but really I decided I didn’t LOVE it enough to jump right into this one. Second books are rarely better than the first though, so I will keep it in mind for those dead times being I have already started this world. I also didn’t LOVE Seven Forges – it sort of redeemed itself a little for me but I wasn’t sure – I thought I’d see how I felt about this one and either give up or carry on on the strength of that one. I actually thought this one was better. Not everyone might agree – I enjoyed it more because I thought the world building was stronger and the characters were a bit better defined.